Our relationship with pets and the meaning they have in our lives have changed significantly over the past few decades. While they were once considered livestock, work hands or just friendly animals to have around, today for many people our pets are loved and cherished members of our family. They are playmates, companions and a comforting presence in our lives. Sometimes it’s because we too don’t understand the intensity of our grief, the physical pain we feel, the frequency and unavoidability of our tears, or how the grief seems to go on and on. As another client confessed, sometimes we suffer deeper and more painful grief that we experienced for parents, grandparents and friends. This can be confusing and complicate our grief further. The change in the nature of our relationship with our pets has led to other unpleasant emotions too. We may feel guilt because we couldn’t afford more extensive medical care. We may regret that we didn’t do more to prevent the death or handled it in the best way. We may lament not having spent more time with our pet, made the transition easier or been there at the passing. 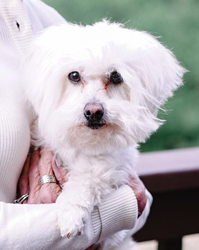 If you are struggling with one of the most heart-wrenching decisions a pet owner faces, when or if it is time for euthanasia – this is a highly personal decision no one else but you and closely involved family members can make. Here is an article from the LA Times you might find helpful. Troubling questions of a religious nature may arise as we wonder if we will see our pet again in the afterlife. We may be confused about whether to get another pet. We know our beloved one can never be “replaced” but others may urge us to quickly “Just get another one.” We may crave to have another pet right away but fear we could never bear to have such a loss again. We may be confused about whether to get another pet. We know our beloved one can never be “replaced” but others may urge us to quickly “Just get another one.” We may crave to have another pet right away but fear we could never bear to have such a loss again. All such reactions are a normal part of the grief process, but sometimes they are hard to sort out and endure alone. 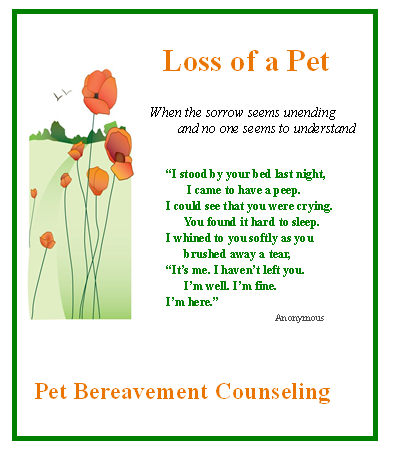 That’s when pet bereavement counseling can help. Please contact me if I can be of help to you. This link takes you to some things my clients have found to comfort themselves in the time of loss. I hope you will find some that are comforting to you. And please share things you have found helpful , too . I won’t print your name.